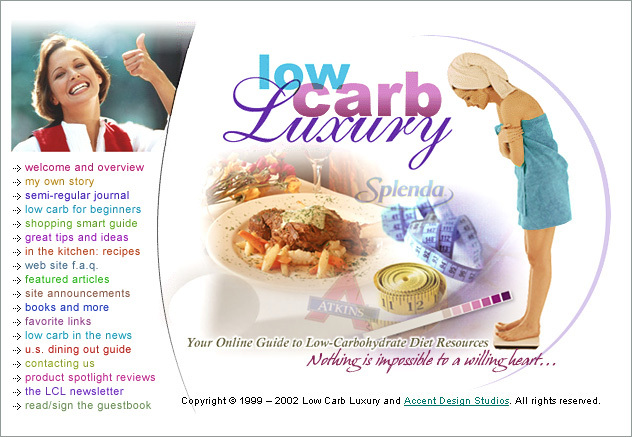 Administrator of Low Carb Luxury, Lora Ruffner (a partner in LNS), began the Low Carb Luxury website in early 1999, as a small personal site. But as the years passed, the audience for this site continued to grow and there was demand for the site to become much more. Three years later, Lora took on partner Neil Beaty as photographer and eventually as President of the company. 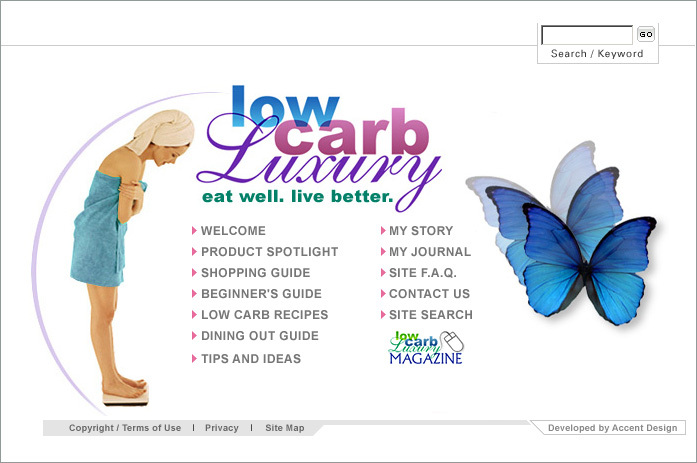 Together, they have built what's become America's leading low carb consumer website, with an audience of over one million each day. They publish an extensive magazine each month for subscribers (it's completely advertiser supported), and they appear at events and seminars around the country. The website has undergone a number of design changes over the years, the latest of which is an LNS Design. Just for fun, want to see how the site used to look? 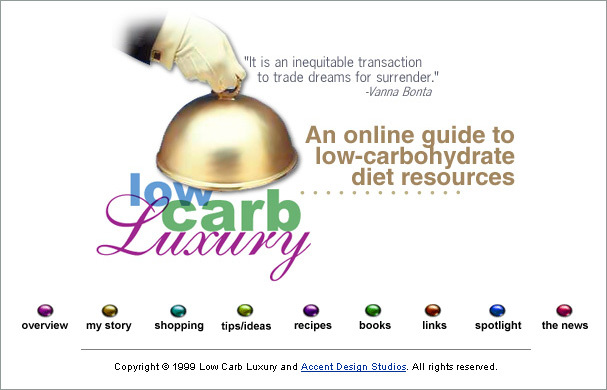 Low Carb Luxury circa 1999 — A pretty small site. Yet the Product Spotlight was already "hot." LCL in 2001–2002 — Now there were a lot of areas to cover! 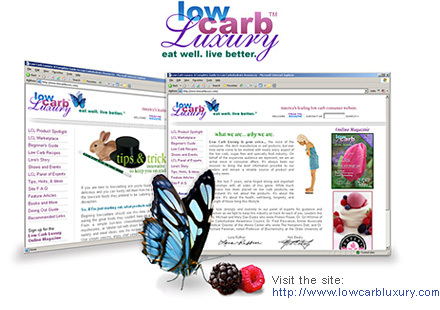 In 2002–2003 — The butterfly (symbol of change) was introduced, and the magazine was in full swing! 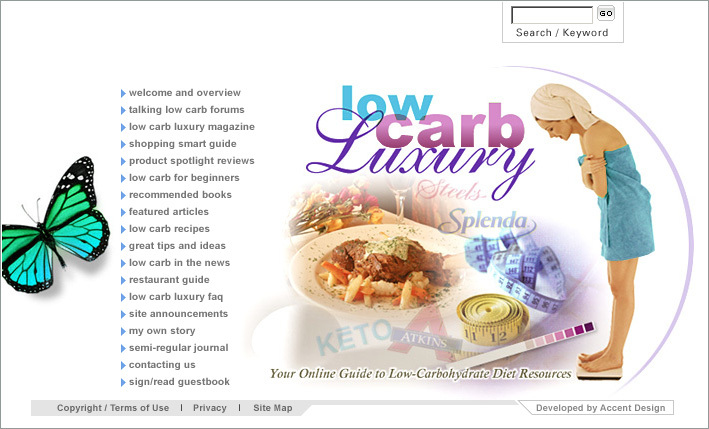 LCL in 2003–2004 — Last design where the first page was merely an entry into the site.